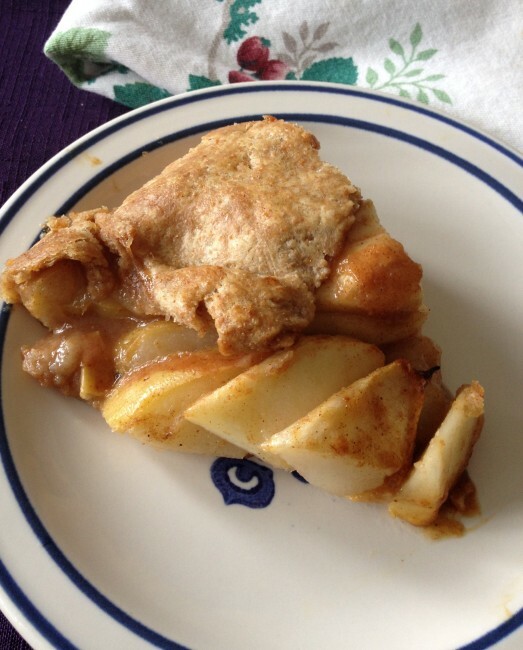 This is by far the best whole wheat pie crust recipe I’ve ever tasted. Boy is it good! Flaky, buttery, and with the wholesomeness and nutty flavor that only stone-ground, whole wheat flour can give. Pack some extra vitamins, rich flavor and fiber into your pumpkin, mincemeat and other holiday pies when you make them with this nutritious crust. 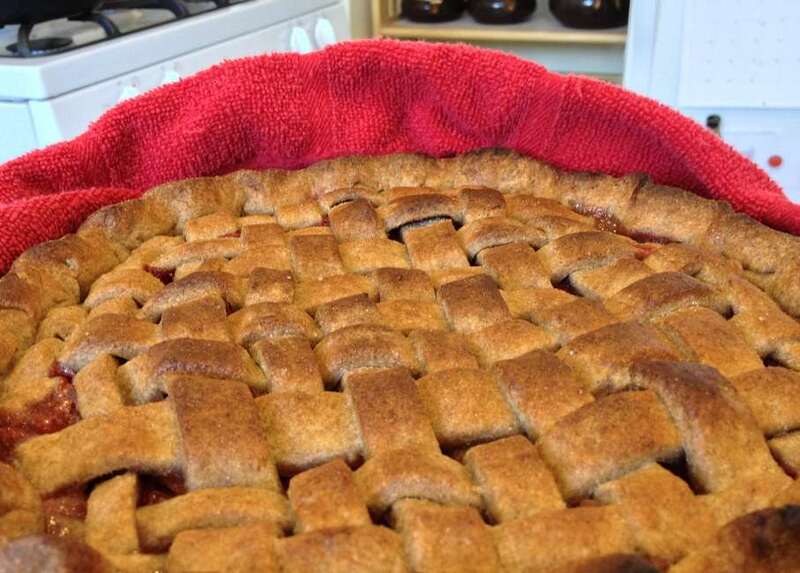 In the springtime, enjoy a strawberry rhubarb lattice pie, made a little healthier with whole grain flour. You’ll see my very first homemade strawberry-rhubarb pie later on this page, along with a link to the recipe (not mine this time) and a video showing the secret to making the lattice top. Or fill this shell with a savory asparagus quiche, which you’ll also find later on this page, and step back and enjoy the oohs and aahs. Oh yes, and it’s easy to make this pie vegan. Just substitute a half cup virgin, raw coconut oil for the butter. Do everything else the same. Your crust turns out beautifully! Before we begin, a word about a new trick (for this old pie baker, anyway), a quick, fun poll and a few words about the tools I use. If you’ve ever baked a pie, you probably know the first rule of thumb for a flaky crust is to chill all your utensils and ingredients. For years, I followed that rule, and it stood me in good stead. A year or so ago, I learned a new trick from Maria Rodale on HuffPost Taste (Yes, my organic friends, that Maria Rodale.). I don’t know the science behind it, but this method really does make for an even flakier crust. Here’s the secret. Start with softened butter. That’s right. Soft, room temperature butter. Mix the dough and cut in the (soft) butter as usual, then chill the mixture thirty minutes before adding your ice-cold liquid. While this method adds time to the overall process, you are free during those thirty minutes to pare the apples, stir up your filling, or get in a little aerobic exercise to burn off some of the calories you’re going to consume once that pie cools enough to eat. 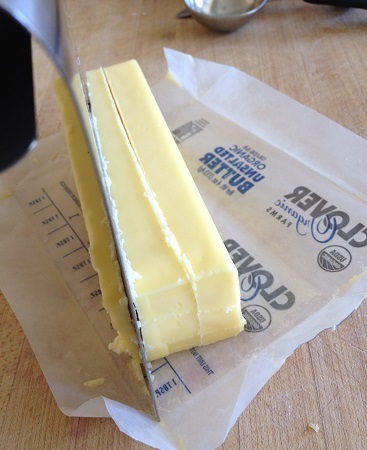 If you have to soften your butter first, (here’s a super easy way to do it), add an extra 15-20 minutes to complete the pie. If it’s already soft, you can mix the dry ingredients and cut in the butter in about five minutes. Now for that poll. Take ten seconds and have some fun with this short poll! Using the right tools can make a difference between a trying task and a fun, successful one. Here’s a list of the tools that will make pie day fun and easy. Oh, and I like to brew a pot of tea to enjoy while the flour mixture chills. Here you see the inexpensive, tapered beech rolling pin, without which rolling pie crust would be a drudge, along with the cobalt blue and white porcelain quiche pan I use for tarts too. Enough of the preliminaries. Here’s the recipe! Whether you’re making a meringue-topped cream pie, a savory pot pie, a quiche or a rustic galette, you can always add a little extra nutritional goodness and taste with this whole wheat crust. Sift the flour, then combine flour, sugar and salt, and sift again. If using coconut oil, add the measured, room-temperature (solid) oil to the flour mixture, cover with flour and cut in with pastry cutter as you would butter. Cover loosely with baker’s parchment and chill in refrigerator 30 minutes. Place a cup of water in the freezer to chill. Optional: At end of chill-time, if par-baking the crust, preheat oven to 450° F.
Sprinkle 4-8 tablespoons ice water over mixture, 1 tablespoon at a time, tossing with a fork after each addition, until moistened just enough to hold together. While still in bowl, quickly form mixture into a ball, working dough as little as possible. To keep hands from warming the butter too much, use a silicone spoon-shaped spatula or wooden spoon to help bring the dough together. 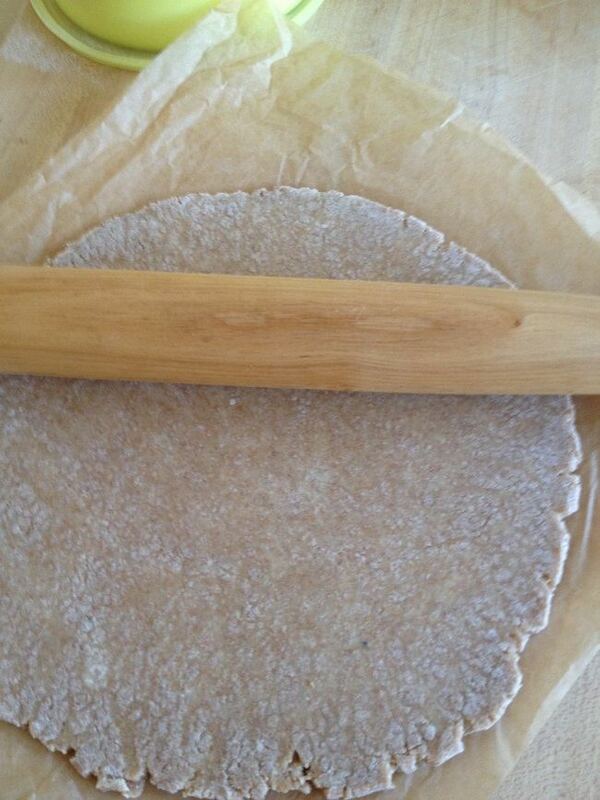 Using a rolling pin, roll the flattened ball into a circle until it is about 1/8″ thick. To keep the dough from sticking to the paper or work surface during the roll-out, periodically lift and flip the dough. Sprinkle tiny amounts of flour over the surface sparingly, and only if needed to prevent sticking. Tip: Roll from the center to the edge, turning the waxed paper 1/8 turn with each roll of the pin. Fill and bake according to your favorite pie recipe. If par-baking for a custard or cream filling, spear bottom with a fork in 1-inch intervals, cover the edges loosely with aluminum foil or a pie ring to prevent scorching and bake in 450º F oven for 12-18 minutes. These are some of the ways I fill my whole wheat crust. It’s not just for the holidays! Some are my own recipes. Others link to recipes on other sites. I use them all again and again. They’re that good. I should write some of them down! If ever those cooks take down their recipes, I’ll be out of luck. When you’re in a hurry and want a sweet treat, roll out your dough, slap a fruity filling in the middle, and fold the crust over the top, all the way round. Brush the pastry with milk or water-diluted egg white, sprinkle a little sugar over all and bake. Eye-popping deliciousness! For handling ease with this galette, roll the dough out on a piece of parchment paper. Then lift parchment and all to a baking sheet. Alternatively, use a peel to pick up the filled pastry and slide it onto a baking sheet or pizza stone in the oven. Bake at your filling recipe’s recommended temperature. Rich with a hand-made Gruyère cheese this asparagus quiche, with its dill-laced crust, is one of those dishes we look forward to every spring, as soon as the first tender shoots show up at our favorite green grocer and farmer’s markets. This is my first ever strawberry rhubarb pie. Grandmom Price is not my grandma, though I wouldn’t mind if she was. I found her recipe online, and we love it! I don’t know why I’ve always felt intimidated by strawberry-rhubarb pie and lattice crusts, but I have, so one spring a while back, I decided to tackle both. Thankfully, Grandmom Price’s granddaughter is a videographer and got her grandmother’s permission to share her recipe and method with all of us. What a find! Get Grandmom Price’s Rhubarb-Strawberry Pie recipe and watch her make her pie. She makes it look so easy, and surprisingly, it is! You can see I have a lot to learn about making a pretty lattice crust, especially crimping the edges. They got mighty thick! Thankfully, the crust is flaky enough, we didn’t mind. I have to tell you, this is the best strawberry rhubarb pie I’ve ever had–and I’ve had lots. While I’ve made quiches for years, I always left the pies to more experienced cooks. My sweet mother-in-law made absolutely the best pies in the world, and she always made two or more so she could serve up a quarter of a pie to every guest. Talk about calories! Since I’ve retired, I’ve had a hankering for her pies. Now she’s gone, I had to start experimenting. This is my first attempt at banana cream pie. Boy, did six of us nosh it down fast! The whole wheat crust is superb with the creamy custard. 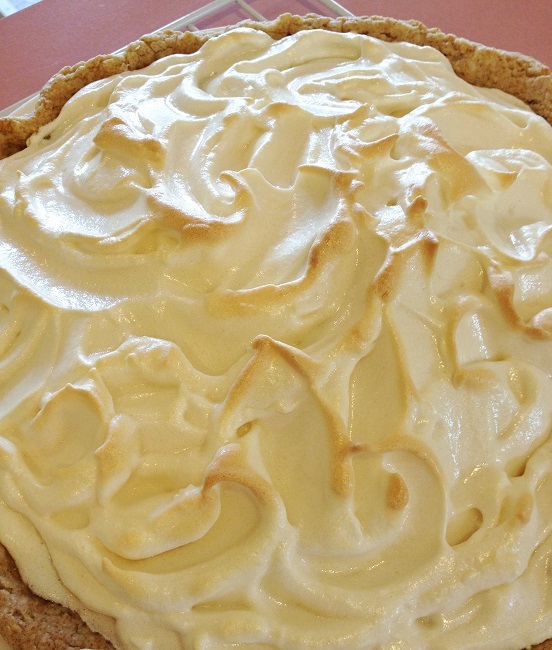 Here’s a link to the filling recipe I used: Old Fashioned Banana Cream Pie at Food.com. 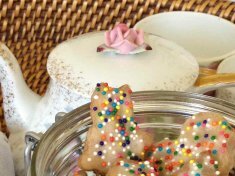 This recipe from All-Recipes.com made the high-volume meringue: Meringue II, by Saundra. Novice Baker? Or feel a bit intimidated by whole wheat? Check out my photo tutorial, How to make a flaky, whole wheat pie crust, with photographs every step of the way. Then practice, practice, practice. No better time than the holidays approaching to practice your baking skills. To achieve ever flakier and better whole wheat crusts, bake often. White flour is highly processed and has additives to help it provide uniform results every time you bake. Because whole wheat literally consists of ground whole grain, lots of variables can affect the outcome. Why not take a pie to Mom on National Pi Day, and have a little math fun while you’re at it, because you know, here in the U.S., we’re all about Mom and apple pie. Right? Did you know that changes in humidity and temperature in your home can affect your whole grain flour? Hot, humid weather can change how your flour reacts to the moisture you add, as well as how much you need. So can cold weather, or a kitchen filled with hot, dry winter heat. Always add just enough moisture to get a supple, strong dough. With time and practice, you will learn when you need to add a little more and when to add less. The more you bake, the more you intuit the tiny tweaks you need to adjust for these variables from one baking day to the next. 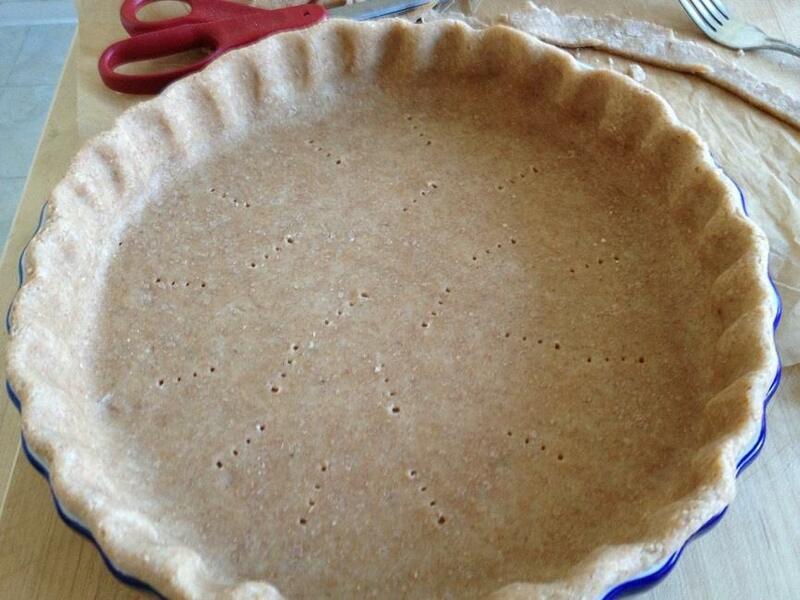 Did you–or will you–try a whole wheat pie crust? Whole wheat pastry isn’t for everyone, but you’d be surprised the converts I’ve made with this recipe. I’d love to hear what you think. If this recipe is familiar to you, it may well be! I first published a version of this article on the now-defunct Squidoo under the username Giddy Gabby, and later still on Squidoo, under the name Graceonline. When HubPages bought Squidoo in 2014, I moved this page there, and in June 2015, here to YayYay’s Kitchen, with significant updates. Last updated: 1/24/18, to make viewing more comfortable on hand-held devices. So glad to have been part of your inspiration. 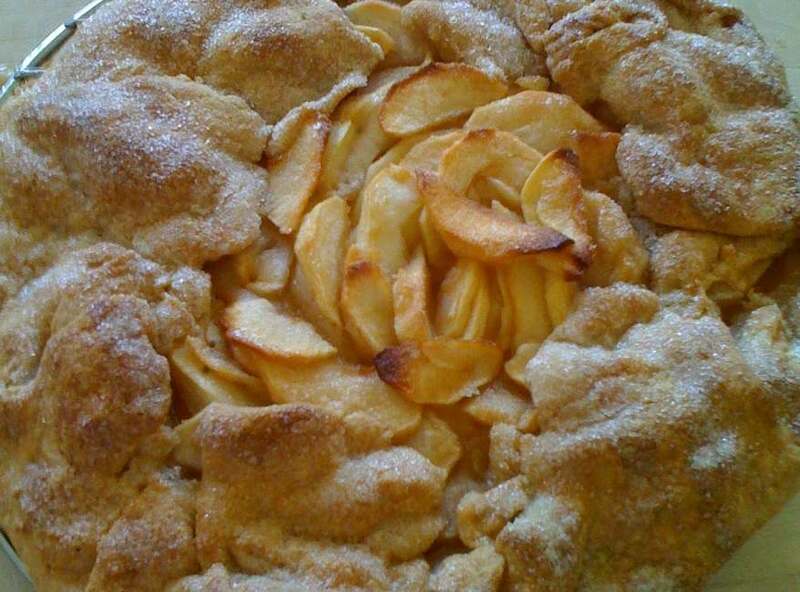 Your galette looks fabulous. I’ve been trying to make whole wheat pie crusts for years, but this is the first time I was successful at it. I was able to roll out and transfer the crust without it falling apart, and it tasted terrific. Thank you so much! You just totally made my day. Thank you! This crust looks soo good. I don’t bake sweet pies, but i do make quiche – this will work perfectly with that. Yes, indeed. 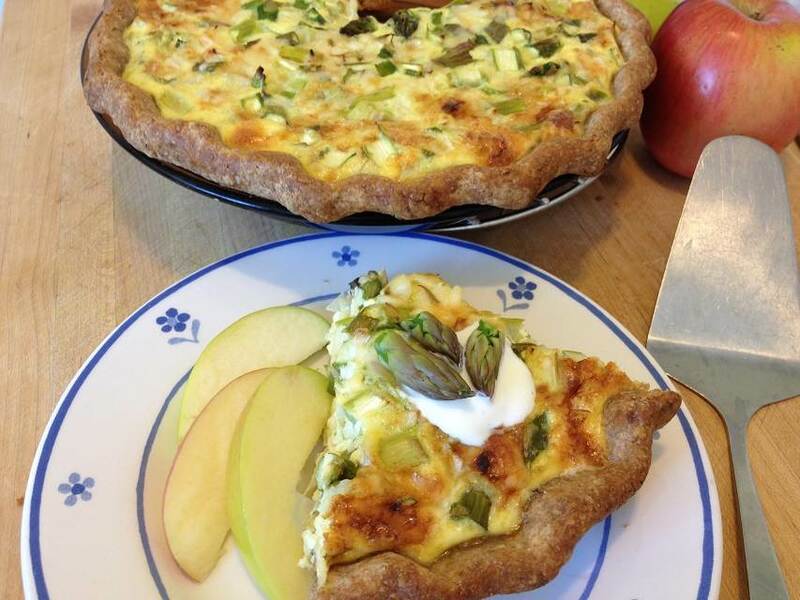 Whole wheat lends itself especially well to the rich quiche custard. Thank you for posting this. I’m vegetarian and also moderately low-carb for medical reasons. Let’s just say cooking can be difficult but it must be done because restaurants aren’t an everyday option. I am excited about this recipe. I’ve bookmarked it and I can’t wait to make it with white whole wheat. I’m making “chicken” pot pie as soon as I can because I got a great deal on faux chicken fillets. Wonderful! I don’t recall at the moment whether I’ve ever used white whole wheat with it, so do let me know how it turns out with those faux fillets. Quite frequently I save the crust trimmings and put them into ramekins with a vegetable pot pie filling. They make a delightful supper alongside a crispy green salad. I have a copy of the recipe you put on Squidoo (albeit rather dirty from many uses). I was wanting to print out a fresh copy to laminate but noticed you altered the recipe just a smidge from 4-5 T Milk to Water? Is there a reason you changed the recipe or is it ok to use either or? Well, first, let me just say you have completely warmed the cockles of this little granny’s heart. Thank you for printing out my recipe and using it all this time! Yes, I did change from milk to water after watching a science demonstration video about the way milk changes the molecules of the flour and butter to make it tough. I wish I had saved the link to that video because I couldn’t find it again after I experimented with the dough, but sure enough, the dough is flakier with water than with milk. I’ll make a note to keep looking for the scientific evidence that backs up the water vs milk theory. When I find it, I’ll add it. Thanks again. Totally made my day. Oh, that galette photo pulled me in! I have yet to try a galette, but I’m quite taken by them and need to try one. I’ll also have to try that softened butter method with the pie crust–it makes sense. Welcome to my kitchen, heytoto. I’d love to see a photo if you make the galette. I don’t make many pies but when I do I make them from scratch and I use coconut oil instead of butter which seems to make the dough tasty and flaky. Thanks for sharing all this information on crust – some of it I was not aware of. Thanks for sharing on Real Food Fridays. Pinned & twitted. You’re welcome, Marla, and thank you for stopping by. Now that I have a wannabe vegan in the house, I make about half my pies with coconut oil instead of butter. We love them! Hi Kathryn! 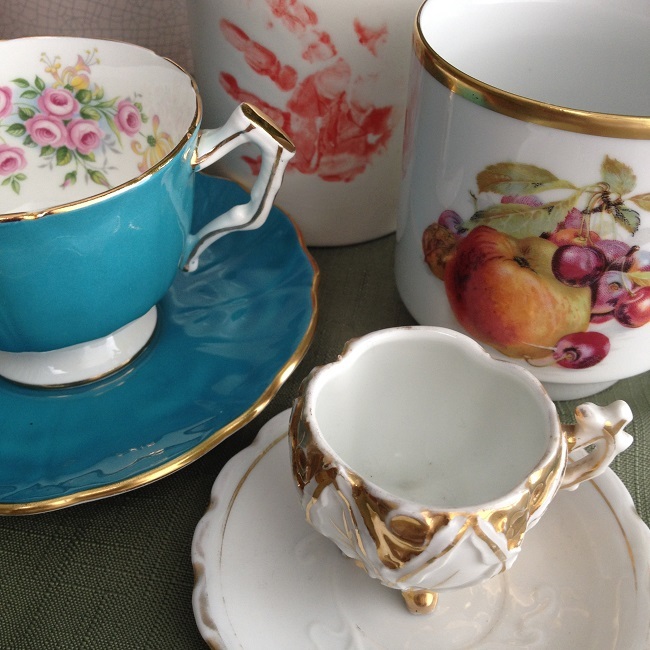 I have just come across your blog and look forward to learning much from you. Everything looks delicious–who knew whole wheat could produce light and flaky baked goods. Love how much you seem to enjoy your grandchildren! Thank you Denise. Welcome to my kitchen. I look forward to chatting with you here from time to time. This looks delicious and I appreciate all the instructions and advice. I’m probably going to make a quiche. Yum! What kind? If you make it with this crust, I’d love to see a photo! Thank you for stopping by. Thank you. Knowing how much you dislike food pics, I’m especially glad to hear you had fun with this post! I’ve tasted this pie crust and it is really really good. And this post makes my mouthpiece and water and makes me want pie right now. 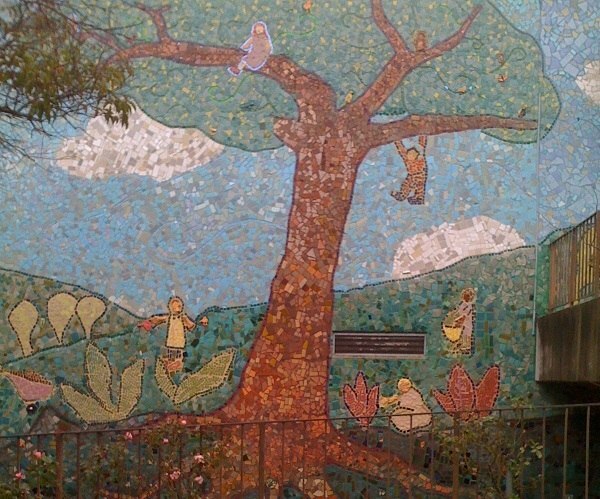 The pictures are yummy looking and your text is easy to follow. I have to say that this is a fun post to read!